In his treatment of legendary Formula One racer Ayrton Senna da Silva (Senna), director Asif Kapadia manages to create a powerful, somber, and sobering biopic that is nearly autobiographical in nature. Without narration, Kapadia leaves most of the storytelling to Senna and a handful of others, interweaving vintage interviews and minimal commentary over archival footage. While the approach tends to carry the film forward with only a few gears and seldom delves deep into Senna's personal life, the decision to skip talking heads lends well to the legend. It also casts a gloomy gauze over the film as Senna tells his own story, sometimes foreshadowing his own end. The conflict between Senna and Prost sparked Formula One interest. While Formula One racing is loved all over the world, American racing enthusiasts generally prefer NASCAR. However, this wasn't always the case in the Eighties and early Nineties as anyone who even had a passing interest in racing knew of the intense rivalry between Senna and Alain Prost. It defined the sport for a decade. Although Prost had several years to ascend as a favorite, winning his first championships in 1985 and 1986 after two consecutive years finishing second, the younger and rasher Senna was seen as the underdog to watch after a strong start during his first year in a car that was never designed to win. His skill as a racer quickly became known at the Monaco Gran Prix. To this day, many believe Senna would have won the race had it not been stopped for heavy rain. But this race and a strong season were still enough for Senna to land a spot on the Lotus team and eventually the McLaren team, alongside Prost. The film doesn't open on the rivalry, however. It opens with a glimpse of Senna's early life. Especially poignant is listening to his father and mother comment after their son won a Formula Three race. It is an ominious foreshadow to a career that would include 161 Gran Prix races, 65 pole positions, 41 victories, 19 fastest laps, and three world championships. "We didn't think that karting would become a career," said Milton da Silva. "But it's taking on a bigger dimension and we're a little worried because he will probably race in Formula 1." While Senna's roots were firmly grounded in the industrial steel making city of Sao Paulo, Brazil, his strength as a racer often seemed more mystical and transcended racing. He believed, and frequently proved, that intuitiveness and intense mental acuity were more powerful than muscle and better tone. In Formula One racing, you need the will to win as it is one of the most physically demanding sports. Drivers typically average 180 heartbeats per minute, peaking at up to 230 beats per minute. They are subjected to extreme heat throughout a race, and average speeds between 200 and 230 miles per hour. They also pull as much as 1.45 gs at acceleration and up to 6 gs while breaking. Kapadia doesn't share these facts in the film, and he doesn't cut Prost any breaks as a nemesis. While Prost did include a clause that prevented Senna from being on the same team as him after 1992, the two did share a mutual admiration. In interviews since Senna's death, Prost often called himself boring by comparison, given that Senna would train physically during the hottest parts of the day and meditate until he could see himself outside the car; things that no other driver did at the time. It is also worthwhile to note that many believe it was the rivalry between the two men that propelled them to dominate the sport. While Senna focused on his ability to improve as a man, Prost focused on his ability to improve the machine. Today, Prost is a trustee for The Instituto Ayrton Senna. Asif Kapadia is a British director to watch. Kapadia is no stranger to producing award-winning films since studying filmmaking at the Royal College of Art. He has directed several, including The Sleep Thief (1997), The Warrior (2001), and now Senna. He is best known for creating films that explore the lives of outsiders, people who live their lives to the extreme. His vision for biopics tends to elevate people above their fields. "The challenge was to make a film that appealed to people who think Formula One is about men driving in circles in oversized cigarette packets," Kapadia has said in interviews. "I guess we must have done it." Whereas Kapadia doesn't provide as much insight into the challenge of Formula One racing (outside of the politics), he does add a richness to the film that previous documentaries have lacked. In fact, even though the film is packed with racing footage, it's the portrait of Senna — his pride in himself, in his country, and Brazil's love for him — that leaps it forward. Senna By Asif Kapadia Roars To 7.8 On The Liquid Hip Richter Scale. The film Senna proves once again that you don't have to be a fan of a sport to appreciate the extraordinary people who rise to the top of it. Although Kapadia may not have given Prost the benefit of the doubt in some circumstances, he creates a near-perfect portrait of Senna as a racing legend whose career was tragically cut short. Senna was 34. 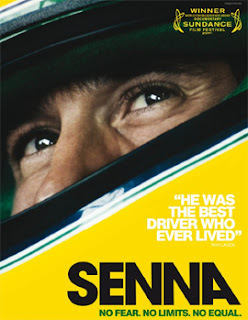 Senna by Asif Kapadia is available to rent from iTunes. While Amazon also carries Senna - Special Edition (2 DVD), the DVD set is Region 2 PAL DVD (Europe). Currently, the movie is also enjoying a limited run in the United States in advance of a wider release or possibly a DVD set. You can find the current schedule on the film's website. Otherwise, the best bet is to rent it on iTunes.